After a great weekend of intense competition, the Cornell men and Harvard women won the 2016 Outdoor Heptagonal Championships. We are going to have fun rewriting the record books due to this meet. 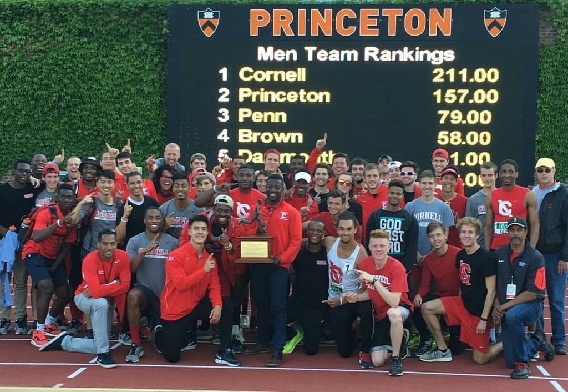 Cornell set a new team scoring record by becoming the first team to score more than 200 points in a Heps Championships. Two conference records were broken – the hammer and pole vault – while an additional two meet records were reset – 110 hurdles and discus throw. Meanwhile, the Harvard women won the meet for the third year in a row. One new conference record was set – the heptathlon – while an additional six events had new or tied meet records – 4×100, 100, 200, 400 hurdles, pole vault, and discus throw. Harvard’s winning score is tied for the 10th best in conference history. The Atheltes of the Meet awards had all sorts of shades of red. Cornell swept the Men awards – Ben Rainero became the first man since 2006 to win the 5km and 10km at the same Heps Championships to take the Track MVP, while Rudy Winkler won the Field MVP for breaking the hammer throw record. Harvard swept the Women awards – Autumne Franklin was award the Track award for winning her fourth 100m hurdle title, her first 400m hurdle title (and done so in meet record time), and being a part of the meet-record setting 4×100 relay; while Nikki Okwelogu defended her Field award by winning the shot put and discus titles again, and resetting the meet record in the discus. Congratulations to all student-athletes on a successful, exciting championship meet! This entry was posted on Sunday, May 8th, 2016 at 4:20 pm. It is filed under Heps Champs, Spotlight. You can follow any responses to this entry through the RSS 2.0 feed.